this geodesic framework is hemispherical, 32 feet in diameter, 16 feet high at the center. made of 3/4-inch conduit pipe, it may be covered with canvas, polyester, and/or clear plastic, depending on the location and season, or for a large permanent weather buffer - leafy vines and spiderwebs! 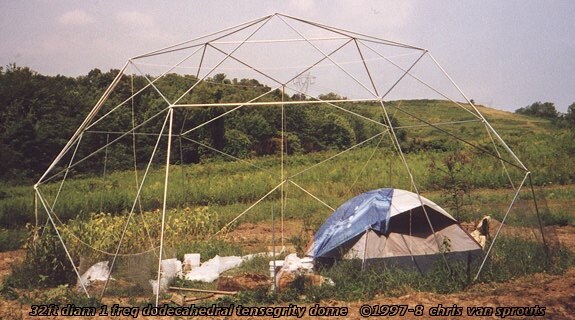 the geometry is based on a one-frequency dodecahedral tensegrity. the frame is made of 3/4-inch EMT conduit pipe, 30 struts 10 feet long, 15 struts 8.7 feet long, and 6 short ground-anchor struts, all connected with 21 fine-thread 1/4-inch bolts. total cost of materials for the frame is about $125 from any retail hardware store, and about two person-days of labor with hammer/anvil and power drill to prepare the strut ends and assemble them.